One of the requirements we looked at in selecting this year’s The Nine was those that inspire us in a way. For some of them, this was easily depicted in project form. As a follow up to the profiles of The Nine, here are some visuals of a few of the exciting such projects that this year’s inductees worked on. Emily Webster led the technology design for ESI at the just recently opened Studio Xfinity, an interactive retail space for Comcast customers to experience the company’s wide range of internet, voice, and home security and automation products and services. 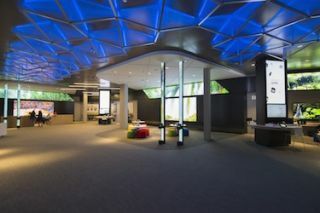 Her scope of work included a smattering of various resolutions of LED, LCD, and tablets with a custom ceiling installation of LED fixtures and metal work. Check out the slideshow. Early in her career, Webster worked with the San Francisco-based artist Jim Campbell, creating large modular LED panels for a production by Alonzo King’s Lines Ballet. The dancers interacted with the panels and used them as lighting at times. The design included a backdrop of glowing spheres that ran video across them. Webster live programmed scene changes and cues that came up during each performance, traveling to New York, Paris, and Sao Paolo. Here are some photos and a video from the artist. And another video from the Lines Ballet. Webster also spearheaded a lab at ESI to test out products and demo ideas for clients. Here’s a time lapse video of an LED wall prototype. Read more about Emily Webster, and why you should know her. Some of the cutting edge research being performed at Virginia Tech’s Cube spatial audio renderer space includes mapping real meteorological data into virtual reality environments. Severe weather expert Dr. Greg Forbes of The Weather Channel gave a virtual reality tour of the2013 Moore, OK F5 tornado. OPERAcraft: A virtually staged opera. Watch the clips and hear from some of the participants. Student programmers recreated the game Minecraft, but presented as an opera. Live singers perform it, but the set and characters are all virtual. Students from a local high school created the story. Merging video games and opera - Virginia Tech from VirginiaTech on Vimeo. In December 2013, a group of Virginia Tech students along with local K-12 students performed OPERAcraft at the Moss Center for the Arts. The project, run through the Institute for Creativity, Arts, and Technology, merged video games with an opera. OPERAcraft's goal is to provide an opportunity for K-12 students to create and perform a fully produced virtual opera. Starting with music borrowed from Mozart operas and a specific number of characters, the project inspires K-12 students to create a story and then the libretto; create the virtual set through a custom version of ubiquitous Minecraft video game/ sandbox; create avatars for each character; and control avatars within the confines of the virtual world. In this site-specific, interactive LED installation, the centerpiece is a room-sized sculpture called Prana. B-Reel designed light sequences to be triggered by people’s breath to visualize the energies of the body. Viewers can stand inside this suspended sphere, which measures 12 feet in diameter and is comprised of over 13,000 LEDs encapsulated in %,422 feet of acrylic tubing. The installation is meant to convey a metaphor for the dialogue possible between humans and the environment, a technology-enabled meditation of sorts. The installation is accompanied by a program of sound and spoken-word performances by various artists, to highlight the relationships between living organisms, technology, and the environment. Readmore about B-Reel and why you should know them.